After blowing up a storm at Globe to Globe, the Q Brothers bring Othello – The Remix to Edinburgh. Elizabethan iambic pentameter is swapped for 4/4 rap beats in a ridiculously enjoyable remix. MC Othello has risen through the ranks of the music industry to become the man with the biggest medallions and most expensive cars. But disgruntled crew member Iago is waiting in the wings with malicious intent. Written and conceived by the superb Q Brothers, Othello – The Remix is nonetheless a joyous piece of ensemble work. From Jackson Doran’s adorable pop prince Cassio to Postell Pringle’s kingpin Othello via Gregory Qaiyum’s dastardly Iago and Jeffrey Qaiyum’s hilarious Bianca, we are offered a smorgasbord of downtown delights. The Q Brothers are masters of comedy but they also nail the sinister side of a world as obsessed with macho pride as Shakespeare’s was. In making Desdemona a bodiless angel – whose vocals soar through the earthy rhythms below – from the start they highlight her powerlessness in this male-led, ego-fuelled industry. Contemporary versions of Shakespeare often miss the point, but with this hip hop version of Othello, full of greed, rap rivalries and jealousy, the Q Brothers have nailed it. For more information on the company go here. For the current season Propeller have created a pretty much pitch perfect Henry V but on this evidence it seems The Winter’s Tale is one play which Hall’s all-male company cannot conquer. 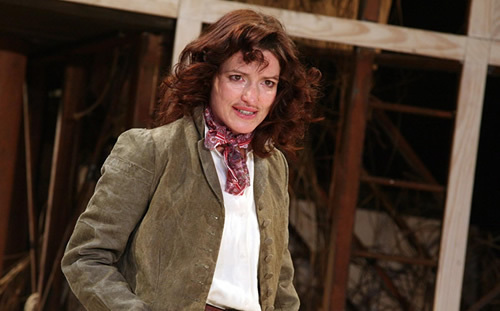 Perhaps more so than any of his plays, Shakespeare’s tragi-comedy explores the relationship between men and women and, more poetically, between the masculine and the feminine; Hall’s production doesn’t quite pull off this delicate process. Within the world of the play the importance of female endurance and faithfulness is highlighted and the idea of redemption is examined. This potent feminine strength is personified not only in Hermione’s dignified exile but in Paulina’s constant vocal protest. Redemption comes in the balanced equality of Perdita and Florizel’s love where no one holds the upper hand. Propeller’s production fails to fully illuminate this aspect of the text. While their Henry V was as complex and layered as it was full-blooded, this is one play where the all-male company struggle to convey Shakespeare’s emotional intricacies. In this case their maleness counts against them – and although Richard Dempsey and Vince Leigh give solid performances as Hermione and Paulina respectively, theirs is not a feminine strength we see put to the test. This Propeller production of Henry V – performed in repertoire with The Winter’s Tale – is my third Henry V in as many weeks. But this is a Henry to conquer all others. 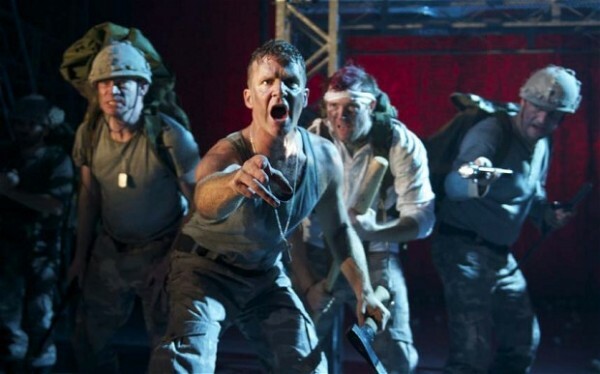 All-male theatre company Propeller are the perfect troupe to tackle this testosterone laden play and they do so with relish in a production which is as relentless as it is engaging. As a friend commented, this is blockbuster Shakespeare. Everything about it is punchy and impressive. Even the scene changes are masterly in their choreography, entertaining in their own right. The piece is powered by a chorus made up of eloquent but bluntly spoken squaddies. Edward Hall’s production places the action firmly in the now, with a soundscape of war that raises hairs on the back of your neck as bullets hiss by. The strong ensemble cast switch between supporting characters just as quickly. These men are, on one hand, aggression-fuelled fighting machines and on the other, vulnerable, human, men of flesh and blood. With the connection between actor and audience at the forefront of every choice, the production offers both detailed realism and enlarged Elizabethan playing.